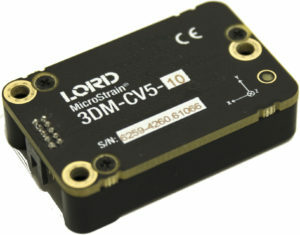 The LORD Sensing 3DM-CV5 family of industrial-grade, board-level inertial sensors provide a wide range of triaxial inertial measurements and computed attitude and navigation solutions at a very competitive price. In all models, the Inertial Measurement Unit (IMU) includes direct measurement of acceleration and angular rate. In models that include computed outputs, sensor measurements are processed through an auto-adaptive extended Kalman estimation filter to produce high accuracy computed outputs under dynamic conditions. Compensation options include automatic compensation for magnetic anomalies, gyro and accelerometer noise, noise effects and temperature. The computed outputs vary between models and can include pitch, roll, yaw, a complete attitude and heading reference solution (AHRS), or a complete position, velocity and attitude solution (PVA). All sensors are fully temperature compensated and calibrated over the operating temperature of -40 to +85˚C. The units are built into an aluminium enclosure, are 38 mm x 24 mm x 9.7 mm in size and weigh just 8 grams. They can be directly mounted on a PCB or chassis mounted with ribbon cable and all come with a TTL serial communication, with the higher performance sensors also having a USB 2.0 connection. The use of Micro Electro Mechanical System (MEMS) technology allows for highly accurate, small, light-weight devices. The free to download LORD Sensing MIP Monitor software can be used for device configuration, live data monitoring, and recording, or alternatively the MIP data communications protocol is available for development of custom interfaces and easy OEM integration. In order of sensor performance, the models available are 3DM-CV5-10, 3DM-CV5-15 and 3DM-CV5-25.